Cornelius, North Carolina has an abundance of lovely, small communities—and any one of them could be your family’s next home. The first step to finding your place in Cornelius is asking a seasoned real estate agent to show you around, and to look for the community that feels like the best fit for your lifestyle, your budget, and your family’s preferences. As you look at neighborhoods in Cornelius, make sure you look into Antiquity. 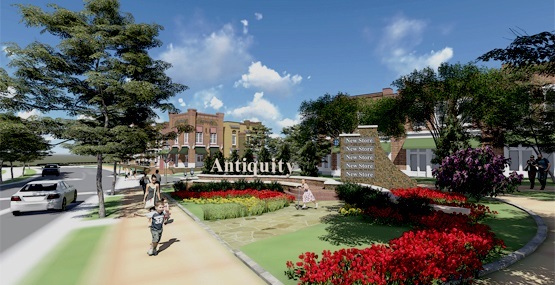 Antiquity is a smart-growth community that’s located just across from downtown Cornelius—about 20 miles north of the great City of Charlotte. There’s a covered-bridge entrance that speaks to the timeless elegance and welcoming vibe of the Antiquity community. Inside Antiquity, you’ll find more than 1,000 residences, including different styles and sizes—residences perfect for growing families, first-time homeowners, retired couples, and everything in between. There is also accessible parking and a town center with ample amenities. What are some of those amenities? Among other things, residents of Antiquity enjoy nine small parks, and plenty of green space to walk, play with pets, or enjoy a quiet picnic. Here are endless sidewalks, hiking and biking trails, and even designated arboretum areas. Families that like to surround themselves in greenery will find much to love about Antiquity! Add to that some really lovely homes and a vibrant retail center and you start to realize just how special Antiquity is—and how perfect it might be for you and your family! Of course, there are additional reasons to choose Antiquity—and one of them is that you get to live on Cornelius! This town couldn’t be more perfectly situated. It’s near to Lake Norman and Davidson, but also not too terribly far from Charlotte. What this means is that Cornelius offers a small-town feel, combined with big-city amenities. It’s one of the hidden treasures of North Carolina, and Antiquity is just one of the many communities that makes it so. We invite you to come see it for yourself. Fall in love with Cornelius, and consider whether Antiquity is the right place for your family to settle down. Ask one of our friendly, seasoned real estate pros to show you some listings. Contact the Minges Cline team to make it happen!